Another direct flight from the US (Las Vegas) to Düsseldorf, new options for connecting from US to Abu Dhabi, plus many new connections worldwide raise airport’s worldwide destinations to over 180 in 50 countries by 60 airlines. Airport breaks the 100 mark for weekly long-haul flights. This year’s summer schedule features new destinations by several airlines, increasing the options for connecting and direct flights for travelers from the US and all over the world. Germany’s Next Generation HubTM continues adding more flight options to all parts of the globe. This year’s summer schedule, effective March 25, 2012, features new destinations by several airlines, increasing the options for connecting and direct flights for travelers from the US and all over the world. Air Berlin adds two new direct long-haul flights, including another direct flight – its seventh -- from the US (from Las Vegas). Air Berlin now also flies direct to Abu Dhabi, daily starting in April. The airline’s strategic partnership with Ethiad Airways brings new benefits for travelers from the US to Abu Dhabi. The flight from NY (JFK) is timed for easy connections to the Abu Dhabi flight. Air Berlin has also added another daily flight to Venice. Lufthansa is expanding its flight options from DUS, as well, also with a focus on leisure travel. The airline now flies to Bari, Burgos, Ibiza, Knock, and Zadar. In addition, new flights to Catania, Dublin, Malaga and Westerland/Sylt are part of the summer schedule. There’s more: Lufthansa has increased the number of weekly flights to six for the following destinations: Bologna, Krakow, and Posen, and flies to Helsinki daily. Air Berlin and Lufthansa are not the only airlines expanding their flight offerings. Russia’s Orenair begins weekly service to Novsibirsk in Siberia, Portugal’s TAP begins daily service to Lisbon., and Emirates switches to the larger Boeing 777 with a 364-passenger capacity for its flights to Dubai. In addition, travelers from DUS can choose from 30 non-stop trans-continental flights, including New York, Chicago, Vancouver, Toronto, Dominican Republic, Mexico, Dubai, Mombasa, and Curacao. Adding to Düsseldorf’s appeal, several US & Canadian cities (Atlanta, Chicago, Ft. Myers, Las Vegas, Los Angeles, Miami, New York, Newark, San Francisco, Toronto, Vancouver) offer non-stop flights. Passengers who continue their journeys can choose from numerous convenient connections to Berlin, Munich, Frankfurt, Hamburg and many other German and European cities. Throughout the year, 70 airlines serve 190 destinations worldwide – among them 125 European destinations. Another major advantage of the airport is its layout. With all gates in one terminal building, Düsseldorf International is the “airport of short distances” – guaranteeing minimum connection times of 35 minutes. 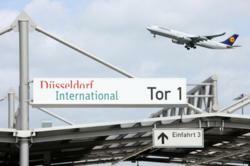 For more information on Düsseldorf International Airport, visit http://www.fly2dus.com. Düsseldorf Tourism & Marketing GmbH is the visitors and convention bureau of the city of Düsseldorf. Its services include tourism and city marketing, conference and meeting marketing, hotel reservation services, fairs and convention services, city event ticket sales and advance ticket reservations. For more information, visit http://www.visitduesseldorf.de.